What a fun find – a gorgeous sterling silver pendant made from a vintage map! A pendant with some place meaningful to you - like a city that you pray for, a country where you support a missionary family, a region where you sponsor a child, or a town where loved ones live – makes a unique reminder. The artist, Anne Holman, sells her jewelry online here. She can make a custom pendant of just about any place you can think of with her supply of antique world atlases. Each piece is carefully hand crafted from sterling silver, oxidized and brushed, then signed by the artist. The photo shows the one she made for me. 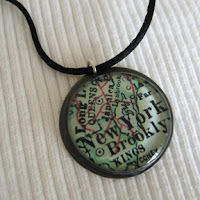 For map pendants in other styles and price points try looking here.